1. All Sycamore students are identified as children with high intellectual potential. 2. Our students have a wide range of academic needs that are met for each student. 3. At the same time, we respect and honor the fact that they are five and six-year-old children, not little adults. 4. In addition to appropriate academic challenge, we always take lots of time for play. 5. Kindergarten children have two recesses and two special area classes each day along with a brief time to rest and “decompress” after lunch. 6. Our Kindergarten students go on 10 field trips and are treated to 13 guest speakers each year. 7. We constantly work to address their social and emotional needs. 8. Our teachers are experienced and trained specifically in the education of young gifted children. 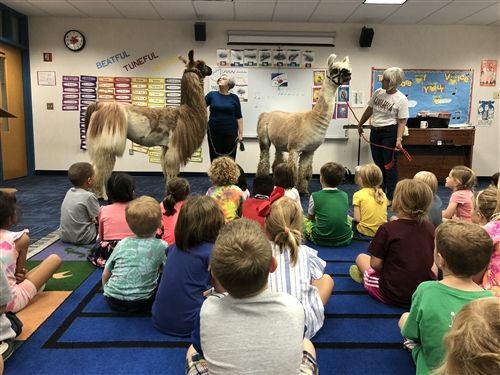 A Llama expert brought two llamas into the Kindergarten classroom to talk about mammals and what makes llamas unique. When the llamas return next fall students will save some of their wool and use it during their unit on the Wampanoag and Pilgrim communities. Students will weave the wool into yarn and use it to make wampum necklaces. During their bookmaking unit Kindergarteners learn the steps in how books are made from brainstorming, writing a first draft, editing, writing a final draft, illustrating, and publishing, to sharing the book with others. Students meet with authors and illustrators and take a field trip to a local bookstore to learn about publishing and how a bookstore operates. 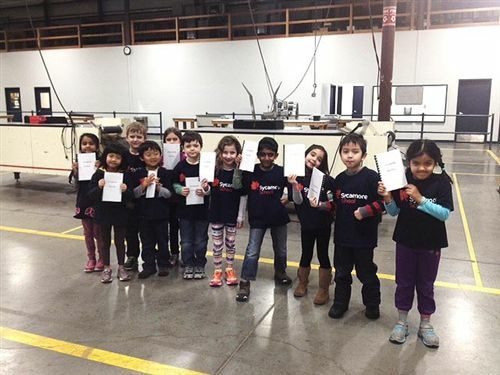 A trip to a book bindery helps them learn the process a book goes through between printing and delivery to the bookstore. Back in the classroom, children create their own hardcover book, writing the book in class, using their word processing skills in technology class, sewing the binding themselves, and sharing their books with family and friends. The students participate in units of study and use a variety of manipulative and art materials. Preschool students read and write to the extent of their ability. Handwriting instruction begins in Pre-Kindergarten. Formal reading and math instruction begins in Kindergarten, and children are grouped with others having similar skills. Students receive instruction from specialists in Spanish, art appreciation, music, and physical education. Each classroom is equipped with iPads, and Kindergarten students go to the computer lab for additional instruction. 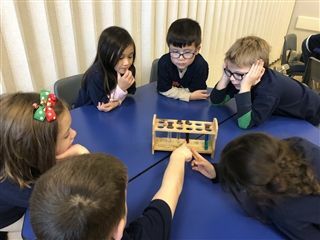 Under the guidance of the WonderLab staff students participate in experiments that focus on solids, liquids, and gasses, along with the physical and chemical changes of matter. Lots of exploration time is provided for them to experience the many exciting WonderLab exhibits including the bubble room, fog machine, and parachute drop. This unit examines why there is life on earth and what it takes for humans to live on a planet. Students learn about the planets in our solar system and their characteristics. They imagine and create their own planet describing it’s distance from the sun, atmosphere, size, landforms, moons, bodies of water, and other characteristics. They discuss whether or not their planet supports life. Students take their ideas to the Innovation Lab where they use a 3-D program to design their planet’s specifications and print their planet on a 3-D printer. Back in the classroom Kindergarteners write about their planets and add them to their display of the solar system.